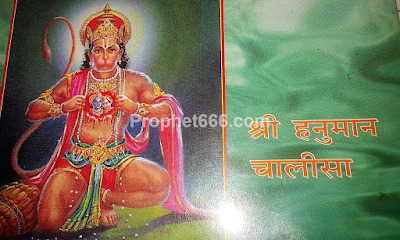 In this post, I have written about a most effective Hanuman Chalisa remedy for getting success in any difficult task or work or to remove the obstacles or problems that are preventing the successful completion of any task, including a task related to your business, profession or social or personal life. This is a one-time Totka, which involves chanting the Hanuman Chalisa 108 times and takes several hours to complete and hence it is recommended only for Hanuman Bhakts who not only know the Hanuman Chalisa by-heart and can chant it without looking at the Hanuman Chalisa Booklet, but also have the strength and stamina to continuously chant the Hanuman Chalisa, while taking Parikramas of a Peeoal Tree. On an average it takes about 5 minutes to chant the Hanuman Chalisa, which comes to 12 times in one hour and hence, chanting the Hanuman Chalisa 108 times will take about 9 hours. There are many true devotees of Lord Hanuman who perform such difficult Sadhanas regularly without difficulty and hence, the simple but most effective and powerful Hanuman Chalisa described in this post can pose no problems for these Hanuman Bhakts. The four steps, described below, have to be performed in order to successfully complete this Hanuman Chalisa Sadhana for removing the problems or obstacles that are preventing the successful completion of any specific task or work. In the Hindi language, this Sadhana is known as the Karya Siddhi or Ichit Karya Purti Hanuman Chalisa Sadhana. 1] The Hanuman Chalisa Sadhana has to be performed on any auspicious Shubh Muhurat, Tithi or on the First Tuesday of the Shukla Paksha of any month. 2] The Hanuman Bhakt should have bath, wear red colored clothes and worship Hanuman. 3] Then, he should go to a Peepal Tree and take 108 Parikrama of the Peepal Tree and while taking each Parikrama he should chant the Hanuman Chalisa one time, this should be done 108 times in all. The Sadhak has to take the Parikrama slowly so that one recitation of the Hanuman Chalisa is completed, while taking one Parikrama of the Peepal Tree. 4] Then, the Sadhak should thank Lord Hanuman and pray for his grace and blessings and then go back to his home and while going back to his home he should not look back or speak to any person, until he reaches his home. It is possible only for mid-level to high level sadhaks who has already attained some siddhis from Lord Hanuman HIMSELF because in 9 hours one has to go to toilet,bathroom,washroom and he will surely get affected by bodily appetites.So,guruji,please write that it is one of the most difficult sadhanas.And please guruji post such types of sadhanas which is easy and quick acting.In today's time,it is almost impossible to find such kind of person who can do and accomplish this sadhana because in 21 parikramas,one's strength and stamina starts to wear out....so 9 hours means whille doing parikrama itself,one may feel extreme dizziness and vomiting sensation or nausea like feeling and may be unconscious at the spot.So,this may be effective but this is one of the toughest sadhanas.I request guruji to post some simpler sadhanas which can be done by every common person including layman. it will take you 2-3 days to adapt your body to not drink water for so many hours, which mean you don´t need to go to toilet, and while your mind and body is busy you don´t feel hunger. to adapt your body this can be done few days or weeks before starting the sadhana. i have done 12-13h Shiva mool mantra for 21days, 200 malas, and it is possible to do so, without being an advanced sadhak. none of it worked, mostly because i kept in getting hurdles, but i felt i needed to try and finish it. The worst thing is, i was having a wonderful relationship which had given me hope in life to live again, which i paused for the procedure.. and after completing the procedure, few months later it ended and she dissapeared. you have to learn the things from your life experience, and learn from past experiences and all kind of situations written in hindu mythology (ramayan, mahabharat, Shiv puran, vishnu puran..etc), and deal with it yourself. the human life, what you go through, reveals whether you are in heaven, if enjoy your life or in Hell to suffer, but its the same place, the earth. Maybe if i was an advanced sadhak it would have worked? will never know, but in case it was true, this should be considered as "discrimination", isn´t it? हनुमानजी के आराध्य श्रीराम विष्णु भगवान् के अवतार थे .पुराणों मेंविष्णु स्वरुप पीपल वृक्ष का बड़ा माहात्म्य मिलता है स्कन्द पुराण के अनुसार " पीपल की जड़ में विष्णु ,तने में केशव ,शाखाओं में नारायण ,पत्तों में भगवान् हरि और इसके फल में सभी देवताओं से युक्त अच्युत सदा निवास करते हैं -इसमें कुछ भी संदेह नहीं है .यह वृक्ष मूर्तिमान श्रीविष्णु स्वरुप है ,महात्मा पुरुष इस वृक्ष के पुण्यमय मूल का सेवन करते हैं .इसका गुणों से युक्त और कामपूरक आश्रय मनुष्यों के हजारों पापों का नाश करने वाला है ." यहां भी हनुमानजी के कवचपाठ में पीपलवृक्ष की महत्ता बताई गई है . यह व्रत वरदान स्वरुप है .इस दिन प्रातः स्नानादि कर भगवान् विष्णु का ध्यान करते हुए हाथ में जल,पुष्प और दक्षिणा लेकर व्रत का संकल्प करें .दोपहर को पितरों की प्रसन्नता के लिए श्राद्ध करें .